If you have ever planned final services for a loved one who has not left instructions behind, you know it is a very stressful and emotional thing to do. One of the greatest gifts you can leave to your own family after you pass on is a plan for your final disposition. It might feel strange, at first, to think about your own death and the services that will take place afterward. But once you have put everything in place, you will have the peace of mind that your family will only have to call the cremation service provider to get things started. By planning your own final disposition, everyone will know what you want and there will nothing will be left to chance or choice. You relieve your family members of burdens during a difficult time. You get what you would like for your final disposition and they are able to mourn you and celebrate your memory instead of wasting time over plans. When you think about your own final services, there are two basic disposition options. You can choose a traditional burial or a cremation. Both methods are completely dignified and respectable choices. However, more people opt for a cremation. While the disposal method has been around for centuries, people now understand the benefits of this option and choose it over a traditional burial. When a body is cremated, the remains are heated into cremains, which many people simply call ashes. After that process takes place, families can have whatever type of service they want, and they can give their loved one a final resting place of their choosing as well. Once you decide that you want to be cremated, it is important to follow the right steps to put the plans into place. Making the decision is not enough to get things settled. You will also have to work with a cremation provider, talk to your family, and do a number of other things to get everything organized and ready. Keep in mind that it’s never too early to plan. Even if you are young and healthy with no end to your life in sight, it’s better to be prepared. Here are some of the recommended steps to take when planning your cremation in advance. You could delay talking to your family until after you have plans in place, but many people like to speak with their family up front to hear their view. If you present your plan to your family, they might have ideas and options that you had not considered. While the cremation itself is for you, any services you have around your cremation would be more for them. It is nice to get their thoughts so you can keep in mind what they need to move on and gain closure after your death. If your family hasn’t experienced a cremation, this meeting is a good time to explain your reasoning. It’s nice to allow your family time to get used to the idea instead of being unexpectedly told about your wishes after you have passed on. Be direct about what you want but allow them to voice their thoughts as well. Make sure you choose the right time for the conversation. Don’t just bring it up at a holiday gathering or birthday celebration. Invite important family members over and tell them you want to discuss final plans, so they know what they’re in for. To make concrete plans, it is important to visit a cremation service provider to discuss the options they offer so you can make final decisions and put plans into place. Once you choose a cremation service provider, they can put the plans together for you in written form and store it on file for you until they are needed. You can have copies, of course, to hand out to family members. When you pass on, all your family must do is call the cremation provider to commence the process. When you speak with the cremation specialists, they will have disposition packages for you to consider. If you’re interested in direct cremation, they will tell you what that entails too. With Fixed Price Cremations, you can get everything you need in an all-inclusive direct cremation package. For example, the staff will transfer your body from the place of your death to their facility. They will care for you until the cremation takes place and then they will process the cremation. They will also take care of the death certificate processes and other necessities. Once the cremation is complete, they will deliver your cremated remains anywhere in Australia. You don’t have to worry about picking and choosing among the services because a direct cremation package includes everything required. The price is affordable at $1,695 so you can save other funds for further services or you can leave more to your family for their needs. The cremation provider you work with will provide you with a simple cremation package for your remains after the process takes place. However, depending on what you want done with your ashes afterward, you might want to choose a cremation urn or scattering tube. You can, of course, leave that decision up to your family, but again, it’s one less thing for them to worry about. Consider what you want done with your ashes as you think about the cremation products you might want. If you are requesting that your ashes be buried, you may want to arrange for a headstone or grave marker. If you would like your family members to keep an urn on the mantel, you may want an urn that represents your personality. If your ashes are to be scattered, a scattering tube that makes the process easier is always a nice gesture. Plus, family members can keep the tube after as a memorial to you. You are welcome to choose cremation products directly from your cremation provider, as they always offer options. You can also get them from other sources and locations. If you don’t know where to start in your search, ask the professionals at the crematory to point you to reputable vendors. Direct cremation is the type of cremation that has no services before the process takes place. However, there is nothing that states your family cannot have a service after the cremation. If you have chosen a direct cremation package for yourself, it will not cost much money and the cremation itself will take place shortly after your death, once the paperwork is in order. Following the cremation, your family will have your cremated remains and plenty of memories about you that they could use for a memorial service. While some choose to leave those details up to family members, it is also wise to talk to you family to learn what they would want. This helps to make the arrangements in advance so no one has to worry about being responsible for planning when the time comes. Many who go with direct cremation want something simple, like a gathering in a park where family members and friends share memories about you and then scatter your ashes. Others might want to celebrate an occasion that feels more formal, such as a funeral, so the public can come together with the family members. Now is the time for you to make those decisions and put things into place. If you need a location for your services, you will have to contact the venues to set things up. Public parks and family homes are easy since they can be open to anyone. Your cremation provider can offer you suggestions as well since they have seen many families plan services after the cremation is complete. Choosing a cremation is a big step, but it’s only one of the major decisions to make in relation to what will be done with your body after you pass on. After you are cremated, you also want family members to understand what should happen with your remains. This is another thing you could discuss with them to see how they feel on certain options. Some might prefer to have an urn with your remains in it so they could keep a piece of you with them while others might not be comfortable with that idea and would rather you have a final resting place they can visit in a cemetery. If you love the ocean, maybe you would like close family to take you to the sea for a scattering ceremony. Find out what your loved ones would find comforting and think about what you would like too. This part of the process can take some time and thought, so do not rush it. You can leave your written instructions with the cremation provider, your family members, and perhaps within your Will so everyone involved will know what you want after the cremation process takes place. It can be very hard for loved ones to write obituaries for someone they’ve lost when they are grieving. What should they include? What should they leave out? What would you want? To avoid those worries and issues on behalf of your family, you might want to write your own obituary. You can keep it simple and straightforward so it will still make sense years from now when they need it. The cremation provider can hold onto it for you and you can pass it on to trusted family members as well. You can also set up other details, like a memory book with some of your favourite pictures in it, a video with childhood movies that family might enjoy, or anything else you want your family to have surrounding your cremation services. With time on your side, you are able to think through what you want for them and how you want to be remembered and give them resources to help them celebrate your life. Once the cremation planning is complete and your provider has your plans in place, you can choose to pay for those services now. There are many benefits to taking care of the costs right away. First, you don’t have to worry about rising costs in the future. Costs are always going to go up in every industry and if you are young and healthy, there’s no telling what cremation costs will be when you need the service, years from now. Instead, you are able to pay today’s costs and still get the services you need in the future, no matter what they cost then. Second, you are doing yet another favour for your family. You aren’t leaving them with costs that they may not be able to afford when your time comes. You have the plans in place, and they don’t have to worry about arrangements, or paying for anything. They can simply gather, honor your memory, and grieve their loss. Taking care of the cremation service costs are simple through the cremation provider. You can also take care of cremation products, like urns, if you discuss your plan with them. If you decide to plan further services outside the cremation itself, you may have to discuss your ideas with individual venues to settle your plans. If it’s not possible to pay for everything in advance, you can always start a fund within your bank account and earmark it for your final services. That way, when the time comes, your family will have something to use to make sure you get the services you want without having to struggle to find funds. Planning your own cremation might feel like a daunting task, but the process can be as simple as you want it to be. Now is your time to have a say in what happens after you pass on. 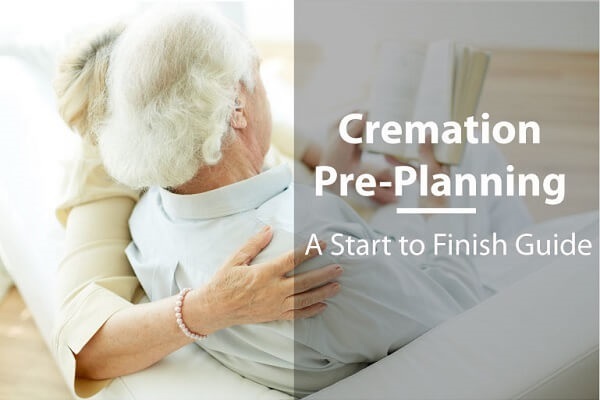 You can plan your own direct cremation, distribute the plans to family members, and get everything set up and paid for with a cremation provider. When the time comes, all your family members have to do is call the cremation provider and your plans will take action. This gives everyone involved peace of mind that nothing has been forgotten. You know that once you are gone, your family will understand what you want. Your family, on the other hand, is able to give you what you want without questioning any decisions they might make around the services. They can concentrate on gathering together and supporting one another during a difficult time instead of trying to make arrangements. Take this time to plan seriously and take your time with the process. One of the many advantages to planning in advance is that you have time on your side. Think over the options with care and talk to your family members about their feelings and thoughts regarding certain choices. You can think everything through until you know you have made the right choice for everyone involved. Often, after a death occurs, family members have to rush through these things to get everything done according to a particular timeline. With pre-planning, that’s not an issue. If you are ready to at least start thinking about planning your own cremation, it’s important to talk to professionals in the field to get options, start with ideas, and have a place to go with questions. Fixed Price Cremations is available 24 hours a day, 7 days a week to guide anyone through the cremation process at 1300 262 797. The low-cost cremation packages include everything anyone needs for a cremation with no hidden costs or fees. Direct cremation packages allow you to get everything you need in one place without any surprises later. Once you speak with a cremation provider, you will feel reassured about the level of service you receive and the simplicity and respect your final disposition can hold. While these steps can make going through the planning process easier, you might still have questions or struggles along the way. What are your reasons for considering cremation? Is there anything that makes you hesitant about making the choice or jumping into pre-planning? Do you have any questions about the process that go unanswered after reading this blog? Leave your thoughts in the comment section and read through what others think on this subject. Many people who are considering pre-planning have similar concerns and it’s nice to be able to reassure one another in a safe and friendly place. Nice article about cremation pre-planning. Really helpful.